One of my current writing projects is a work of non-fiction – it’s a 'How To' on tackling aspects of online promotion and making it fun. 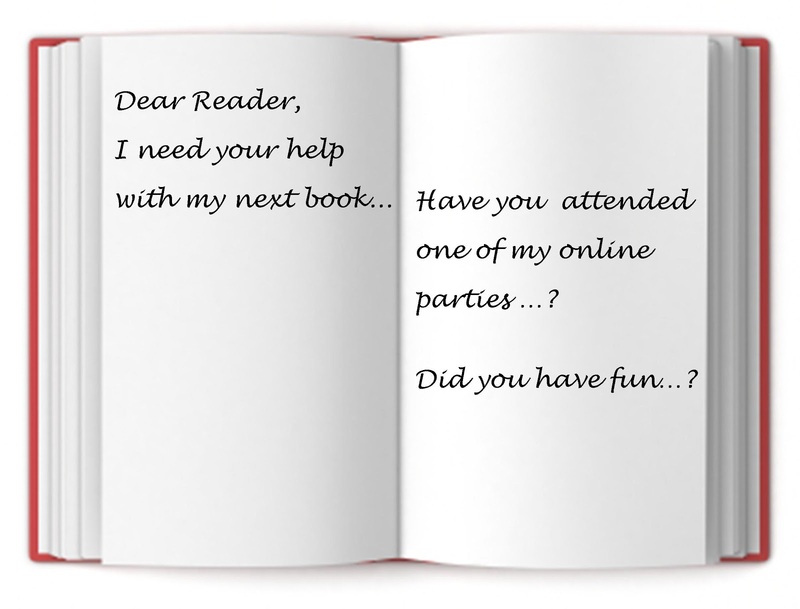 I’ve been prompted to write this by lots of lovely fellow writers who, over past year or so, have emailed me for advice on hosting online parties to promote or launch their book/s. Some of those writers are debut novelists and others multi-pubbed. Some are with traditional publishers and others are indie. Most have previously attended or taken part (and reportedly enjoyed) my launch parties and want to know how I did it and more to the point, how they can do it too. 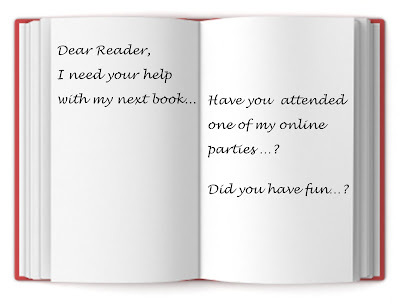 The title of this new and fun look at book promo is ‘How to Promote Party Online’ with the emphasis on the party aspect, because everyone wants to have fun, right? Q1: Have you attended one or more of my launch parties - which one/s? Q2: Did you personally find it fun and engaging – and can you say why? I’d really appreciate your feedback as it will help me enormously. The info you give will help me to focus on giving helpful advice. If I would like to use your comment as a quote – please be assured that I would always contact you first to ask for your permission. The book will be available soon from Amazon for Kindle. Thank you in advance. I attended How Do You Voodoo and Voodoo Wedding. I loved writing a poem for How Do You Voodoo, sharing it on my blog and reading other people's poems on theirs. For Voodoo Wedding, it was fun posting an old wedding photo and seeing other people's. I won't be much help since I think I've only been to 2 of your launches, the first as a very quick drop-in. The second, however, really was a lesson in how it should be done. It was the Voodoo Wedding and the idea of having us post photos of our own weddings (or, in my case, my niece's) was brilliant in that it set up a series of interactions between lots of the different people who came - some of whom I'd never 'met' before. As a result of posting the photo, I kept getting emails telling me that comments were still being made long after I'd left. Which, of course, sent me back to the orgiastic mêlée. Good luck with the new book. I've been to all four of your online parties. My favourite, though, was your Spellbindingly Fun Party for the launch of How Do You Voodoo? followed by the Reaching for the Stars Wish I Was Here Party. Thank you Emily - thanks for your comment. I really enjoyed your party posts and appreciated your enthusiastic partying. I'll have to get my thinking cap on for something fun to do for the launch of the next in the Voodoo Roamnce series 'Voodoo Child' later this year! Hi Bill! Thanks for your comment which is indeed helpful to me. I do love the idea of a orgiastic mêlée!! Thank you Melanie - that's really helpful and interesting. I too enjoyed the Spellbindingly Fun party for the launch of 'How Do You Voodoo?' which asked quite a lot of people - as they had to write out their own spells - I so was amazed and impressed by so many fabulously clever ones!! Absolutely LOVE your blog parties! Favourite - Spellbindingly Fun party for the launch of 'How Do You Voodoo? 'Great fun coming up with a spell and thrilled to bits to win :-) Love how you come up with such innovative ideas for each one. The How Do You Voodoo party was a blast! I loved it... it was great being a part of something that involved so many different blogs. I think we all had to produce a spell, didn't we? It was very unique and totally engaging! I attended all of the parties with the exception of Bagpipes and Bullshot. I loved the parties because of the amazing amount of fun and the laughs we had! Even if some of us ended up in twitter jail! I took part in Reaching For The Stars online party. What I enjoyed about it was reading all the other blogs that took part in Wish You Were Here blogging about their favourite place to go to, everyone had something different and I won a chef's hat too. You have held some really fun and fab parties Janice! All have been great to join in, but I particularly enjoyed the Voodoo Wedding. It was lovely to see everyone posting their photos - inspiring! I think my favourite was Wish I Was Here and Voodoo Wedding party. I liked the Spellbindingly Fun party but found it more difficult to contribute to that one. I'm sure you are going to be able to give everyone some great advice Janice. Looking forward to reading it. Hi Caroline! Thanks for your lovely comment. I think we met online through the Spellbindling party, didn't we? Thanks for being such a great support and such fabulous fun. I was thrilled when you posted a photo on Facebook of your purple tartan perfumed candle prize! Thank you Sheryl, yes the party was fun, and it did take some planning. The book being a bestseller on that day was certainly the icing on the cake for me. Hi Suzy - yes I LOVED reading everyone's spells and whizzing from blog to blog - it was all so very exciting! Thanks for your comment and for being such a fun party peep! Hi Anne! Yes, I too enjoyed the launch party for 'Reaching for the Stars' - my disgruntled celebrity chef who disappears from the spotlight for a while. It was fab seeing everyone's 'Wish I Was Here' photos on their blogs - made even more enjoyable as the party was mid December (my photo was an Indian Ocean beach hut! )So glad you won the chef's hat! Hi Linn - yes, the wedding photos were wonderful - and just like a real wedding, I found myself getting quite emotional over some of them! Hi Sue and thanks for your interesting comment, which made me think. I do remember thinking that I was asking an awful lot of people with the Spellbindingly Fun Blog Party - as they all had to write their own spell from the 'ingredients' I'd set out on my blog. So I was astonished and bowled over when I saw the level of support on the day and amazed at how clever everyone was with their 'poetry'. My own spell looked quite pathetic in comparison I thought,lol!! Hello Janice, I've been to all of them and it would be difficult to pick out a favourite. What I think worked was that they were all different and each had an element of surprise. Asking 'guests' to do something specific ensured personal involvement -key to the success of any 'virtual' event. Thank you Myra. I agree inviting party peeps to have a personal involvement is a good plan - and it certainly helps with those party host nerves when people have said in advance that they will turn up on the day! I enjoyed all your parties, Janice. I particularly liked having to make up a spell, and post my favourite destination - both on my own blog, which then linked to yours. Hi Janice! I didn't attend your wedding one, but I did think it was a great idea and it caught my eye! Hi Rosemary thanks for your comment - I do agree that having a 'task' and then blog hopping is one of my favorites too! Hi Talli - I have seen a photo of you in your wedding dress and you looked stunning so it's a shame you couldn't attend - but it's okay 'cos I know you had a good reason not too! I'm already thinking that the launch party for Voodoo Child later this year might be fun for you - as you could dress up young Master TR in a cute Halloween outfit for it - lol!? Wenn Sie möchten, wow gold kaufen dass genug bekommen Halterung Währung Fischerei ist definitiv eine andere effektive Technik. Besondere Spieler können Arten von Fischen gut verkaufen im Auktionshaus für viele wow gold von World of Warcraft und die Fische sind sehr beliebt. Was die Spieler tun, ist nur zu einigen wow gold oder einige Aufgaben im Spiel, aber nicht das Denken oder wagen es nicht, in die übergeordnete Spiel zu bekommen. game card wow Für viele der Spieler sie haben Angst vor ihm und hatte nicht das Vertrauen oder nicht wissen, wie man in die Schlacht zu gewinnen. PVP ist so anders, dass man nicht auf die Idee von dem, was dein Gegner gerade denkt. Einige Spieler denken vielleicht, dass es schwierig ist, im PvP gewinnen, auch wenn sie spielen in dem Spiel für eine lange Zeit oder sogar einige Jahre, aber einige von ihnen sogar nie haben wow items kaufen die PvP im Spiel nach langer Zeit zu spielen.